As a main microphone setup the Faulkner Array belongs with the spaced array stereophonic recording systems, where only the time of arrival difference is involved in the distribution of phantom sources across the loudspeaker base-line. 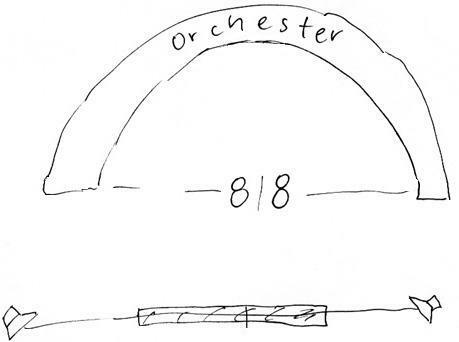 Two figure-of-eight microphones are used, parallel to each other and spaced 20 cm or 7.87 inches apart. However this is not like a modified ORTF microphone system because level difference plays no part. There is no microphone angled outwards. What worries me is that I find it hard to imagine how the full stereo stage from left loudspeaker to right loudspeaker can ever be filled using this microphone array. With the Faulkner Array only the time of arrival differences can have an effect, given the narrow microphone base-line of 20 cm (8 inches), since level differences with bidirectional microphones will be, at best, marginal. Lateral (from the side) sound sources are always strongly attenuated by the characteristic figure-of-eight pattern. 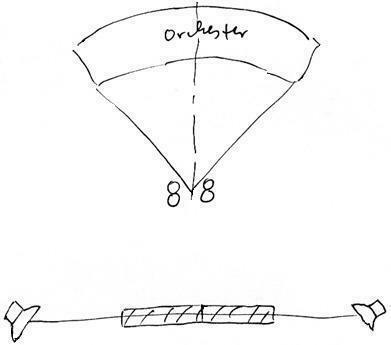 The following sketch shows the microphone setup in front of an orchestra. In this case, at most, only half the loudspeaker stage width will be filled. Even with this large orchestra range (±90° = 180°) the maximum stereo width of direct sound can only ever be half the loudspeaker stage width. and the level difference is below Δ L = 1 dB. There must be a strong center signal. Watch the small stage width, which results between the stereo speakers.